One of the greatest Korean inventions ever is definitely Hangul, the Korean alphabet. "Hangul Day" is celebrated every year on October 9th, which is assumed to be closest to the date when Hangeul was finished in 1446. *Note that Hangul is used in this post to help the readers' understanding. Hangul was created by King Sejong. In 15th century Korea, only elites could read and write, using complicated Chinese characters. King Sejong made a whole new writing system to let ordinary people easily express their thoughts. Quite a few scholars disagreed with his idea because they were worried about the relationship with China, but King Sejong was firm and did not change his mind. 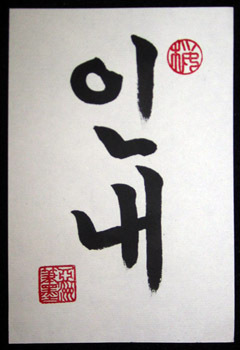 At first, Hangul was called "Hunmin Jeongeum," which means "The Proper Sounds for the Education of the People." The Haerye(the explanation and examples for Hangul) mentions that "a wise man can learn Hangul before the morning is over, and even a stupid man can learn them in ten days." Hangul is known as a very scientific and easy writing system. Linguist James McCawley said that Hangul is the most ingeniously devised writing system that exists. Consonants ㄱ, ㄴ, ㅁ, ㅅ, ㅇ got their shapes from vocal organs like the tongue and throat. A new consonant was made by adding a stroke to each consonant. The sound of the consonant becomes stronger. Consonants can also be doubled to make "tense consonants." "ㆍ"(arae-a) was made after the "round sky," "ㅡ"(eu) was made after the flat earth, and "ㅣ"(i) was made after a person standing on the earth beneath the sky. Combining the three vowels, you can get ㅗ(o), ㅏ(a), ㅜ(u), ㅓ(eo), ㅛ(yo), ㅑ(ya), ㅠ(yu), ㅕ(yeo), ㅘ(wa), ㅝ(wo), ㅢ(ui), ㅚ(oe), ㅐ(ae), ㅟ(wi), ㅔ(e), ㅒ(yae), ㅖ(ye), ㅙ(wae), ㅞ(we). Hangul is known to be the easiest writing system because the consonants and vowels have their own rules, such as combinations and adding strokes. 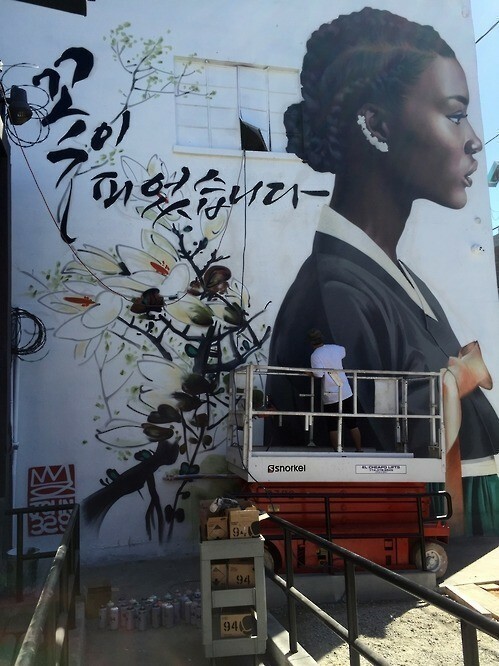 Hangul in graffiti: "A flower has bloomed." Though the original Hangul characters might seem like shapes you see in geometry, it has a unique beauty when written in many different ways. Never forget King Sejong, who made Hangul in spite of so many opposers. * If you are interested in learning Korean, visit Key to Korean. It's a wonderful website!